I’ve been working on some new designs to debut at BlytheCon Europe in Paris this year! I’m really happy with this Rococo influenced design; a dainty confection in a most surprising color scheme. It reminds me of a Mod Marie Antoinette, so I’ve named it after the Dauphine’s nickname, Marietta. Back to the bows! Hope to see you all in Paris! I simply can not rave enough about the amazing event that is BlytheCon Europe! I have been super lucky (and very determined) to attend/vend all three years of its existence and every year, the organizers do a fantastic job. This year, Joelle and Filipa knocked our socks off! A giant hug to everyone who stopped by my table! Seeing good friends, meeting new faces, creating and playing together are the reasons I make in person doll events a priority. I leave them full on crazy in-love-with-life. You are all adorable and extraordinary! 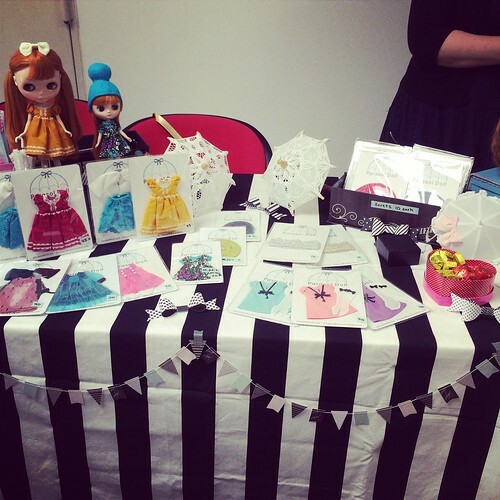 BlytheCon Europe 2014 also ushered in the debut of JOHNNDO! Johnndo is a spectacular spectacle and the king of inspired selfies! It all came about when our good friend, John, had to cancel his trip to BCEU. I met John at the first BCEU in Berlin and this year was supposed to be his first time vending. Kismet interrupted. That would not do, so I devised a plan with Monica to bring John with us, if only in spirit. It was decided that Monica’s Wataru, Mondo, would wear a John mask to the event and the Recalcitrant Johnndo was born! The adventures don’t stop there – I’ll be in Seattle for BCUS in less than two weeks! Let us hope that a worm hole is not created by John and Johnndo being in the same room together. I hope to see you all there! The first batch of Framboise Macaron dresses are complete! The next batch is cut and ready to be sewn. I will have a few of this color available at BCEU in Amsterdam this summer. Up next is the sunny yellow, Citron (D) color way! Interested in a Macaron Dress of your own? The Macaron Dress list will reopen in August. I hope to have some for sale at BCEU Amsterdam and BCUS Seattle!